Progressive bluegrass at its best. Miners Creek fuses Bluegrass with pop, rock, jazz, folk, Latin, Appalachian, gospel and blues. Their rich three and four part harmonies, infectious music, driving rhythm and a whole lot of humor will make you smile, tap your feet and feel a happy glow long after the concert is over. ​Founded in October 2013, the band performs extensively in and around New England with a few sojourns further afield. They have opened for Red Molly and David Dodson; performed at the Bronze-Wound Showcase at the International Bluegrass Association Conference in Raleigh, NC; the Thomas Point Beach Bluegrass Special band competition; Joe Val and Jenny Brook showcases; and performed on the main stage at Bluegrass on the Bogs and the North Branch Bluegrass Festival. In August 2016, the band won 2nd place in Billy’s Belly Bluegrass Competition. They released their 3rd album, “All Stove Up” in June 2018 and are back in the studio getting ready to release their as-of-yet-unnamed 4th album sometime in the spring of 2019. 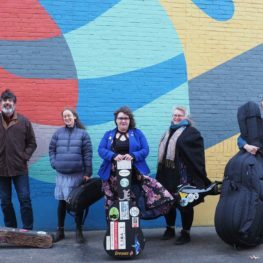 In addition to performing, the members of Miners Creek also teach bluegrass jamming, make quilts, sing Sacred Harp music, sing in the Midcoast Community Chorus, sea kayak, sail, and randomly quote quips from esoteric cult movies that very few people understand. Miners Creek takes its name from a hiking trail near Frisco, Colorado – where founding members Resa (guitar/mandolin/banjo) and Whitney Randolph (banjo) spent many of their early years before meandering east to Missouri, Pennsylvania and eventually to Maine. Other band members have followed equally rambling paths. Lead vocalist Emma Theobalds was born near Toronto, OT but moved to Maine when she was 5. Fiddler Emily Horne Jeffries hails from Birmingham, Alabama by way of western Massachusetts. Bassist Ethan Hotchkiss moved to the Northeast from Pasadena, California, graduating from Keene State College and eventually landing in Midcoast Maine.